No art to post for all of you just yet so I decided to do a little show-n-tell in the meantime! It waited patiently at the grocery store and when we met I knew it would be MINE. 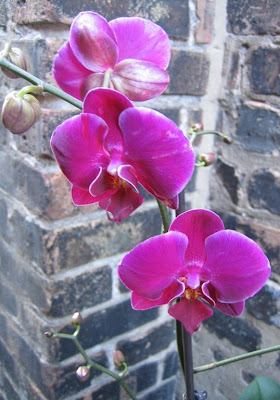 Here's the latest orchid plant I bought for myself this weekend! With regal purple blooms like this, how could I resist? This'll be my fifth orchid I own in addition to the 50+ houseplants I already have. It may not be a painting but it's definitely nature's work of art. It's really amazing that there can be so many different shapes and colors from plants which grow in the same sorts of soils. (I know some need one type or another, but there is still variety among so many which live side by side.) And it's great that you have such an eye for their beauty and are generous enough to point it out to others. I hope you'll find time to paint something and put it on e-bay. It looks beautiful, Dean. I hope you will get much enjoyment of all your plants time and time again. That is one gorgeous flower! How can you not smile and be filled with glee when looking at that!! My mother would turn this into a watercolor immediately. 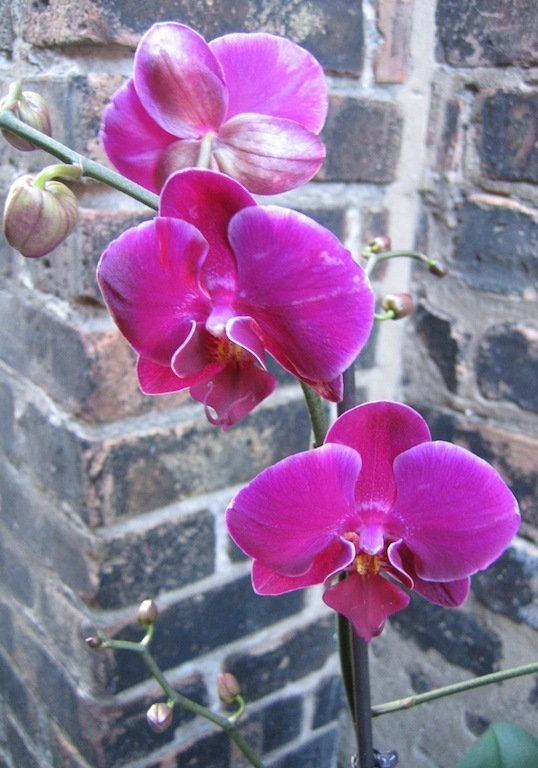 We used to have lots of orchids. Haven't gotten any here yet, although we see them all the time. I think I'll wait until the cats are more predictable! I love the rich color of the flowers against the weathered brick. Beautiful! They always lift my spirits. You just have to find the right plant(s) for you. There are many houseplants which are extremely hardy and difficult to kill. Same thing with certain outdoor plants. And fresh garden tomatoes RULE! Those pics were taken by the side of our house, which is entirely made of brick. I appreciate all of you weighing in here!